The aim of every hospital is to make our clients satisfied so how you solve troubles with health of your patients is the most important how you can gain and satisfy your clients or you don’t… Bad reputation spreads very quickly. Our aim it to improve and gain very happy clients for your practice. The main idea how we can do that is to build and preserve regular health tasks in preventive care and curative care as well. Disease prevention is much better than treatment. Veterinary service VitalFox will help you to achieve happy clients with positive references. VitalFox informs your clients in time that there is prevent care task (e.g. vaccination) or planned appointment time is here (e.g. consultation, surgical intervention or another appointment). People always come to your hospital in time and on time. It eliminates “weak hours” and maximizes effectiveness of your clinic and your staff. Animal keepers won’t forget scheduled appointment anymore. Active vs inactive client ratio increases so active clients will be the major part. Time is money. That’s true, we know it. Have you ever tried to calculate how much is it when your clients forget to come on time? Or they forget their pet should be revaccinated… or they miss appointment or surgical intervention or consultation or etc… We have calculated it and loss of profit is huge. With our VitalFox service you can prevent this situation and money lost. Pet holders always come on time and you are able to give them the best care ever. It often happens that you find out during routine clinical examination that this animal has serious health problem and it must be treated before revaccination. His owner is often not able to find it out. And try to imagine pet owner would not come to your practice because he forgets. You wouldn’t have a chance to cure them. You wouldn’t have a chance to provide preventive care. So you would lose your money twice, sorry, more than twice because this client would be counted in inactive client list. It is not good for your practice. Let’s have a look at situation when your clients come to everything is ok you can vaccinate his pet and offer him various preventive scenarios how to make life of his pet better. Now it is up to you how you communicate with your clients and their pets. To sum it up, which scenario is better? When your client comes and you can give them the best possible care? Or when your client forgets to come? Which one situation is more profitable for you…? We want VitalFox is so effective as can be. Our service will save you money because you don’t need to pay for phone calls, postage, … and SMS or emails are the cheapest way how to maintain regular contact with your clients. VitalFox is so smart that you don’t need to allocate your staff to do something. You set all functions of VitalFox only once and then forget it. 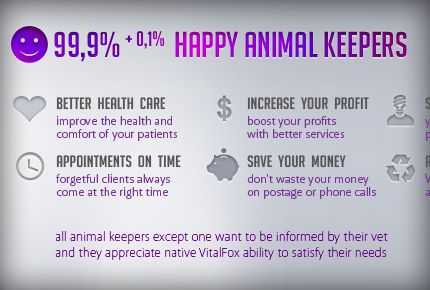 Your staff is here for patients and your clients, not for VitalFox. Your management is more, your clients stay informed, everyone is happy. In case your staff must do all this communication maintaining with your clients manually it is really time consuming and ineffective. Leave this work for VitalFox and let your staff to do more important things. VitalFox operates autonomously and fully automatically. Another great feature of our service – it is environment friendly solution. Save rain forests, petroleum, paper, renewable and non-renewable resources too. Look forward to more articles about the benefits of VitalFox.